Were getting to the time of year when people review the year just gone and plan for the year ahead. I guess I’m doing the same, although I will leave the ‘my 12 best images’ post to others. It’s interesting to look back over the last year and see what images I consider to be my best how these compare to last years work and how they relate to one another. 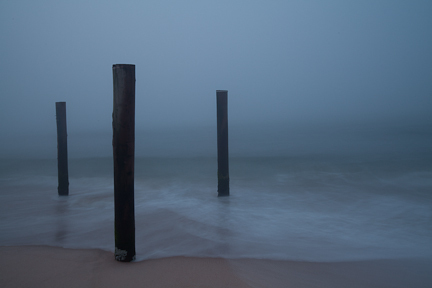 I started the year with the intention of making a set of color images of the coast on clear mornings. This idea began to evolve during the course of the year as I made a number of images during foggy conditions, trying to make the most of my time photographing. Even with a clear plan of what you want to achieve, being flexible enough to respond to the situations you find yourself in, can lead you in directions you hadn’t expected. Perhaps for you, as has been the case for me, these photographs will be standouts and serve as jumping off points for new projects. This entry was posted in Photo of the Week and tagged Beach, Close to Home, Learning, Mastery, New England, Ocean, Portfolio, Sand Sea Sky by nixonphoto. Bookmark the permalink. I have come back to view this photo, Andy. I like it a lot. So simply stated but it is one of my favorites. Maybe the composition, the softening of color. Anyway, I’d hang this in my home and look to it each day. It has allure.